The best time to visit Assam! A long vacation of 20 days was planned. Mom prepared a variety of local cuisines for Vidur which included Laai Xaak (mustard leaves), bamboo chicken, duck cooked with kumura (bottle guard), maati daal (black gram), various types of local fish, aloo pitika (potato mash) and lots of bhoot jolokia (ghost chillies) considered to be one of world’s spiciest chillies. Every item was served in a traditional way and in our traditional copper plates, bowls, glasses etc. Apart from eating so much, we also visited a lot of places such as Pobitora Wildlife Sanctuary, Kalakshetra, Maa Kamakhya Mandir, Nagaon, Umananda – the world’s smallest river island, Shillong, Cherrapunji, Jowai and many more. 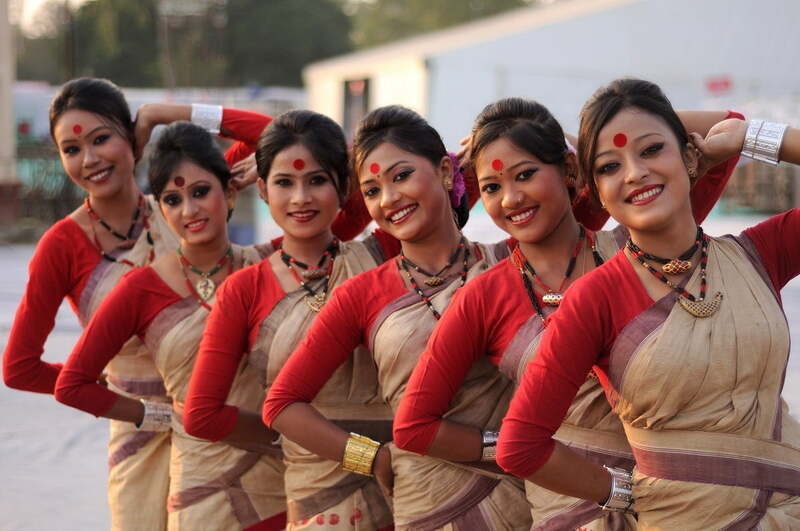 Bihu is the main festival of Assam and it is celebrated in honor of the harvesting season. In other words, it is the Assamese New Year. During this season, the city looks so beautiful and colorful. There is so much fun, music, excitement, and entertainment everywhere. Assam celebrates three types of Bihu such as Rongali or Bohag Bihu in April, Kongali or Kati Bihu in October, and Bhogali or Magh Bihu in January. The celebrations of Bhogali Bihu starts one day before the actual day. People come together and build temporary pavilions known as Meji made of wood /bamboo or hay where they picnic together and party throughout the night. Next morning or on the day of Bihu, everyone takes bath before dawn and proceeds to the meji, which is then burnt down after performing some rituals and offering various edibles to the God of fire. On this day, everyone is dressed in their best traditional attire; hence Vidur and I decided to go traditional too. Bhogali Bihu comes from the word “bhog”and it is a festival of food. A lot of eatables are prepared by the ladies of the house. They include Til pitha, tekeli pitha, naarikol ladu (coconut laddoo), Sunga pitha etc. During this time, the gigantic Brahmaputra shrinks in size and people grab this opportunity to plan their picnic party near the riverbed, giving them a chance to spend some time with their friends or family without spending much money. We also made a short trip to Nagaon which is where my parents were born. I took Vidur to show him our ancestral house and the family pond. This is where, as kids, we sisters would spend hours fishing. We also visited the village temple located in Nagaon known as the Bargiya mandir. Interestingly, the temple is actually shared by 12 villages located close-by. During our visit there, we noticed that some family had arranged for a Bhagavad Path and all men were dressed in dhoti or loincloth. In Assam the Prasad offered to their deity is somewhat similar to what Bengali’s offer in their Prashad. It consists of a variety of grams and fruits such as soaked chickpeas, green lentils, coconut pieces, ginger, pomegranate seeds etc. Visiting Assam at this time of the year was probably one of the best decisions we made. Nagaon visit brought back memories of my childhood. We are so glad this was the first trip of this year. So much fun, laughter, and celebrations. We also got a chance to watch the live performance of Papon and Zubeen Garg! If you are looking for more destinations in the Eastern states, check out Kalimpong here. I’m planning to visit North east and need some guidance. Please can u help me.